"a high-flying, fast-paced cosmic adventure"
17-year-old David Beveridge is in the wrong place at the wrong time. When a gunman storms into a convenience store demanding money, he becomes spooked and shoots the cashier before shooting David. Only David doesn’t die. Neither does the cashier. She dies, yes, but David manages to bring her back to life. With the help of a mysterious silver ring he found earlier that night — a ring with amazing powers that David cannot control, a ring he cannot even take off his finger . . . and a ring that the darkest evil in the universe wants for its very own. It’s coming for the ring. It’s coming to destroy us all. The Silver Ring has not been tagged yet. Help others find The Silver Ring by tagging it! What seems like any other day for David takes a turn for the worse when a ring he finds at the movie theatre ends up having magical powers beyond his comprehension. Just as he begins unravelling the mystery behind the ring, he finds himself chased by mysterious beings, and his very life is in danger. 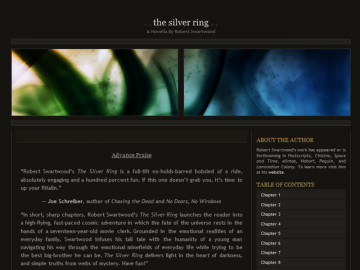 The Silver Ring has not been recommended yet.